EVERYONE’S still talking about the bombshell that showbiz princess KC Concepcion dropped last Sunday. Well, I won’t dwell too much on it, since I don’t want to add any more to the noise. And as her mega-mom Sharon Cuneta did say, KC and Piolo are adults. In other words, KC knew exactly what she was getting into. Of course, like many single, unattached women...KC’s desperate cry about wanting to find true love does tug at the heartstrings. But who, where and how to find it—that’s the big question. Well, if you ask feng shui consultant Marites Allen about love, she can tell you that she is proof positive of how geomancy can help us single women find Mr. Right. After a failed first marriage back home in Cebu was annulled, Marites says she was able to activate her love life and attract many suitors with the help of feng shui. She says she found her Prince Charming—an Englishman whose name she declines to reveal due to privacy issues—and married him. That is, “only after I carefully studied his chart!” Marites says she is very much happily married, with a wonderful family life with their four children. What’s more, she now has a great career as one of the country’s top feng shui consultants. Marites, who is president of the World of Feng Shui Philippines, spoke to the media recently in a preview of Manila Hotel’s festivities to help usher in the Year of the Water Dragon on January 22, 2012. Marites adds that KC’s best allies or friends are Snakes or Roosters. SPEAKING of Rats, guess who was born in that year, KC? Well, it’s none other than President Noynoy Aquino, who was born in 1960. Hmmm...KC and P-Noy? Well, why the hell not?! I think it could be a perfect match! Both of them are smart, well-bred individuals. They both belong to respectable families with their feet dipped into politics and show business. So there would be an immediate understanding of each other’s priorities, background, and ways of thinking. Okay, so there’s a 25-age gap. But maybe a more mature man (accent on the latter quality) is exactly what the young KC needs. After all, this is a lady who virtually grew up without a strong male figure in her life. It was really her mom Sharon who was both mother and father to her, rearing KC as best as she could. As for PNoy, he is no stranger to relationships with younger women. His ex-girlfriend Shalani Soledad is 20 years his junior—so what’s an additional five years in the case of KC? But more important, KC and P-Noy have compatible Chinese zodiac signs! She’s and Ox. He’s a Rat. Who knows, it may just work! Marites adds that stress will bring tension to a Rat’s life, but his allies “are there to the rescue him.” A Rat’s best friends are Dragons and Monkeys. The year 2012 will be a generally favorable for those born in the year of the Tiger, Rabbit, Horse and Sheep, she says. To indicate how momentous the transformation in 2012 would be, Marites recalled the previous Water Dragon years, the last one occurring in 1952. That year saw the passing of King George VI of the United Kingdom and assumption into office of his daughter Queen Elizabeth II. The first hydrogen bomb was detonated in 1952, ushering in the nuclear age. World War II also came to an official end with the Treaty of Peace signed between Japan and 48 countries aligned with the Allied powers coming into force. She says although 2012 “will be better than 2011,” the Year of the Rabbit, “it does signify continuing disharmony, with conflicts between governments and social classes, and political and social unrest. There are to be key leadership changes; and social and industrial disputes are to escalate.” 2012 in an election year in the US, France, Russia and India, she points out. 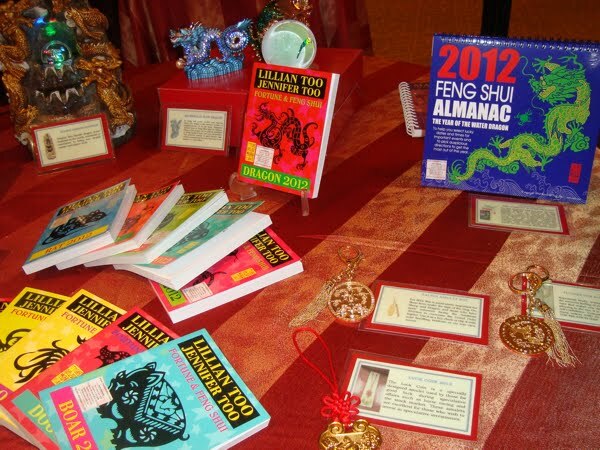 Marites will unveil her other 2012 predictions on January 22 at Manila Hotel’s Chinese New Year celebration. A Grand Chinese Bazaar will be held on the hotel premises featuring different stores selling lucky charms, house decorations and delectable Chinese delicacies. While the fireworks light up the evening sky, hotel guests will dine on a feast prepared by Executive Chinese Chef Sun Bing at the Mabuhay Palace. The dishes will symbolize luck, longevity and wealth in the coming year. Doomsday enthusiasts believe the world would end on December 21, 2012 because the calendar of the Mayans—a now-extinct indigenous civilization that once dwelled in Mexico—ends on that date. Well, I looked through Marites’s feng shui almanac for 2012 and it does include a 2013 calendar at the back. Whew!